My three year old has become very enamored with having "Fancy Nancy hair" lately. We've been going through hairstyle blogs and trying out tons of new styles. She's been a brush-and-go kinda girl for so long, I realized we have very few hair lovelies. A quick trip to Michael's and a nice, long nap from the baby remedied that. 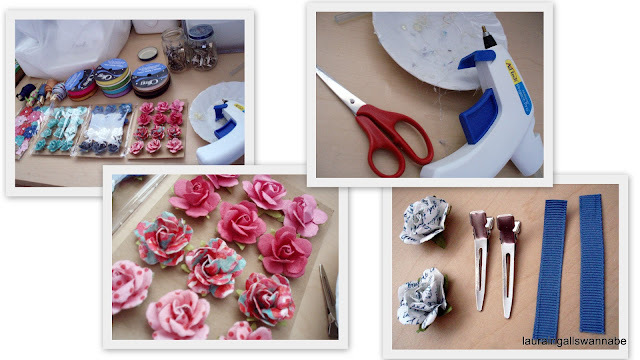 I found some scrapbooking embellishment flowers in the bargain area of Michael's. $2/12 flowers. I'm not sure what they're made of. They're sturdier than typical paper flowers, but I don't think they're made of fabric. I gathered 1 3/4" single prong alligator clips (purchased in bulk years ago from an Etsy seller who is no longer in business, it appears), 3/8" grosgrain ribbon, scissors, and my hot glue gun. 1. Cut a piece of ribbon about 1-1.5" longer than the top of your clip. 2. Put a dab of hot glue on the top prong that you pinch to open the clip and attach the ribbon, leaving 1/2 - 3/4" hanging off the end. 3. Wrap that excess underneath the prong and attach with another dab of hot glue. 4. Smooth the ribbon down the length of the clip. 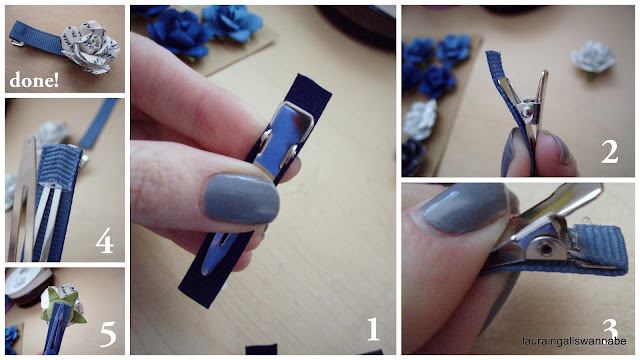 Pinch the clip open, wrap the ribbon underneath, and secure with a dab of hot glue. You can either hold the clip open while the glue dries or prop it open with a pencil. 5. 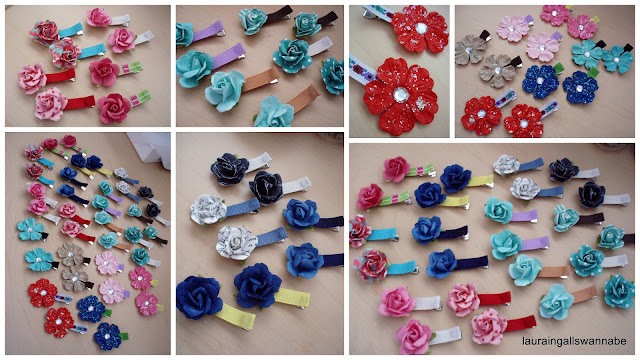 Attach your decoration to the top of the clip. I put the flowers right near the open end of the clip on these ones. My cooperative little buddy woke up just as I was finishing the last of 36 clips. You stick the embellishment at the opposite end to me. How interesting. I have a few that I stuck on the other end, but I kept squishing them with my thumb when I opened and closed the clip, trying to decorate a moving target.